Well, all of us know about the episode of Thomas Munroe and Raghavendra Swamy. However, not many know that Rarayu himself gave the reason for appearing before Munroe and talking to him. This is the story of Munroe and Rayaru. 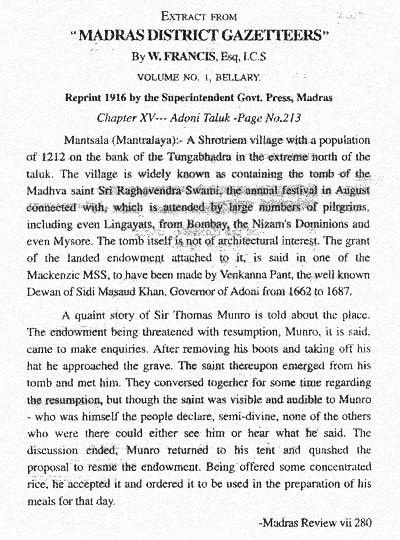 When Munroe visited Mantralaya, he was the Collector of Bellary. 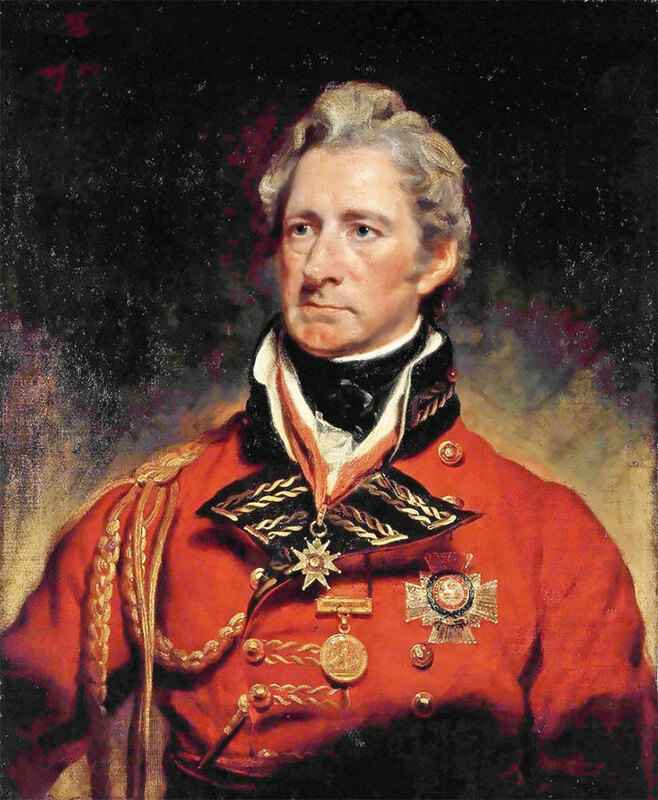 He had been offered the post after the final Anglo-Mysore war of 1799 in which Tipu Sultan had been killed. The British had parceled out the territories of Tipu among their allies and also allowed the Wodeyars to retain lands in south Karnataka. The British had decided to keep the territory surrounding Bellary. There were two reasons for this. The last Vijayanagar Emperor had been pensioned off and his territory taken over by the British. The second reason was that Bellary and surrounding areas had been the stronghold of Tipu and the British did not want any further resistance. Munroe had ordered the revenue officials to rationalise their system of collection. As temples were centres of revenue, he wanted the revenue officials to exercise greater control over them (This is what the Governments in India do now. They decide to take over a temple or religious institution under the Muzrai Act whenever they wanted to exercise greater control over them). 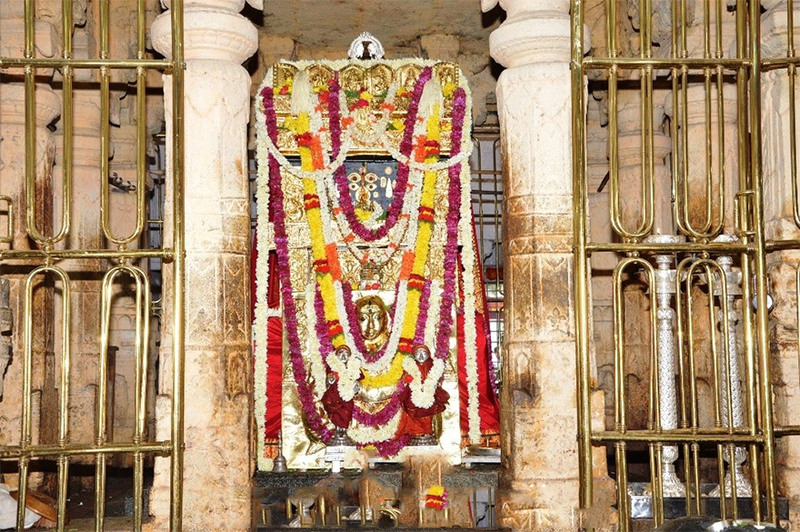 The then Government of Madras asked Munroe to ensure that all the revenue from the Raghavendra Swamy Temple in Mantralaya were remitted directly to the Treasury. Munroe passed on this order to the revenue authorities who failed to act. When there was reminder from Madras about the revenue pending from Mantralaya, Munroe decided to take matters in his own hand and decided to visit Mantralaya. It was sometime in 1800 when Munroe came to Mantralaya, When he was told about the holiness of the place, he respectfully removed his shoes and also his hat and entered the matha. 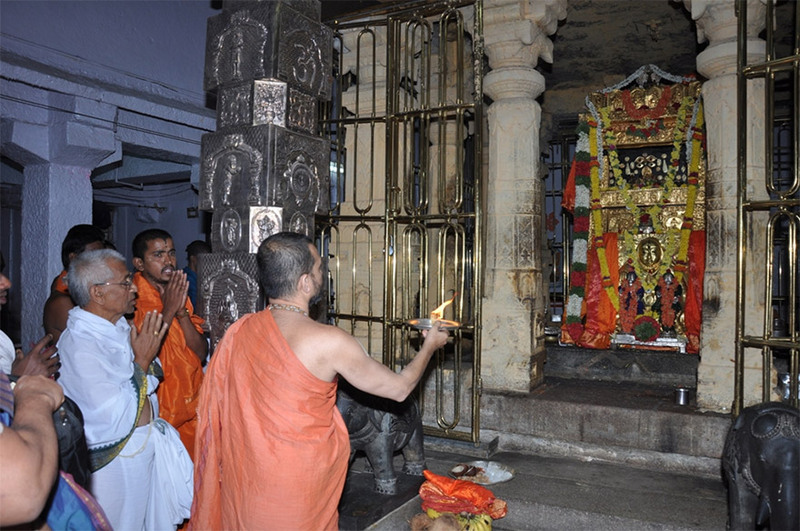 He then walked towards the Brindavana of Raghavendra Swamy and began looking at it. Even as he was watching the Brindavana, he slowly began seeing a figure seated in the Brindavana. The figure emerged more clearly to show itself as a saint and Munroe soon began his famous conversation in English. The officials accompanying Munroe and the temple priests looked askance as they saw that Munroe was speaking with himself. They could not see Rayaru. They were also surprised to see Munroe clutching Mantrakshathe in his hands. Munroe went back without collecting the revenue and wrote an order against collecting revenue from the math and sent it back to Madras Presidency. I have seen this order in Fort St. George. A copy of this order is also in the possession of the matha in Manthralaya. Let me go back to the story of Munroe and our Rayaru. Soon, the news of Munroe having spoken to Raghavendra Swamy spread far and wide. There were celebrations in Mantralaya over the issue. However many devotes, matha officials and even the priests of the temple were disappointed that Rayaru chose to appear and speak before a Britisher while they were denied any such privilege. “What is so great about Munroe that Rayaru gave him darshana,” they asked. 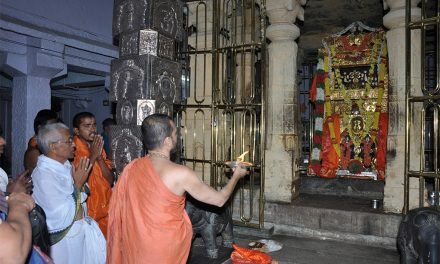 The Pradhana Archaka of the Raghavendra Swamy Temple and others were discussing the eposode regularly and voicing their disappointment that they had so far not been given any such darshan. One night, Rayaru appeared in the dreams of the Pradhana Archaka, who was also a party to the discussion, and told him that there was a specific reason for physically coming before Munroe. Rayaru disclosed that when he was on earth as Prahalada in Krita Yuga, one of his classmates was Munroe. Rayaru durng his previous avatars was Prahalada, Balika Raja (He was killed in a mace fight in the Kurukshetra war by Bheema. He had to fight against the Pandavas as he ws asked to do so by Bheesma, his kin) and Vyasa Raja. He also told the Pradhana Archaka, that Munroe had been assigned a task to be completed and he could do that only in his later avatar as a British official. Munroe, Rayaru, said had repaid the debt by waiving off the revenue. 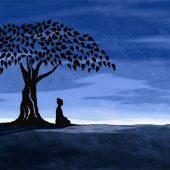 He had, therefore, the unique privilege of seeing Rayaru and conversing with him. By the way, there is a statue of Munroe in Chennai. The statue shows him seated on a horse without a saddle. The statue was made by Francis Legatt Chantrey, the famed English sculptor. There is another reason to remember Munroe. He set up a committee in 1826 to look into the issue of public instruction in Madras region. One of the recommendations of the committee was to set up Presidency College in Madras. Looking forward to Artcle on Miracles of Rghavendra swamy. time I hear this story. Thanks. Most of us know lord Monroe visited mantralaya but many of us don’t know reality that they were friends previous j anma or Avatar. I am thrilled to this article.How fortunate is, Munroe. This clearly makes one to believe earlier samsara.Thanks for giving this information om Sri Ragavendraya Namath. 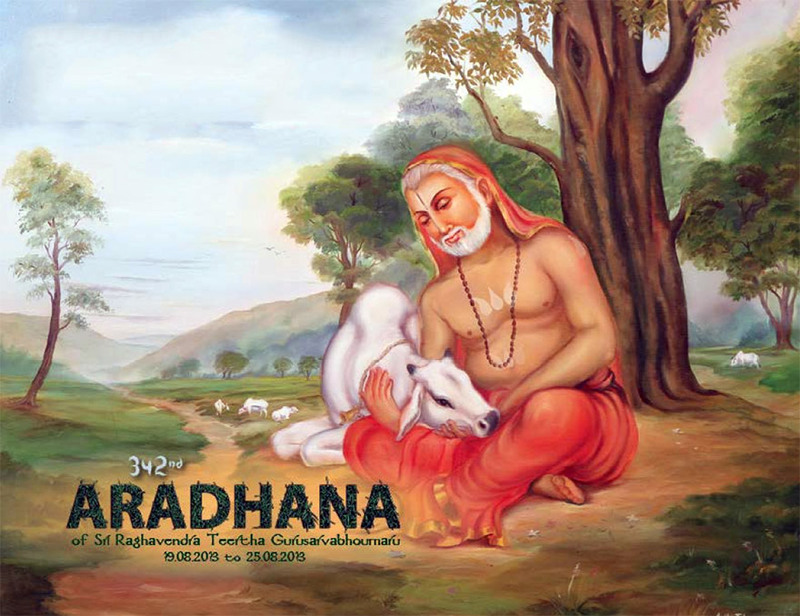 THe miracles of Sri Raghavendra Swamy are well known. Though they may not be explined scientifically due to its limited scope,their truth cannot be questioned. 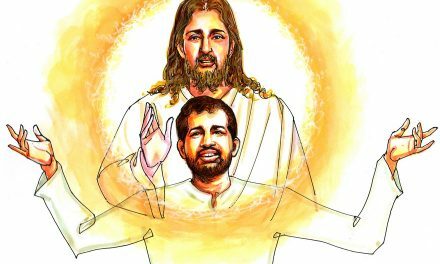 Both Raghavendra Swami and Shirdi Sai Baba have one thing in common. They solve the material difficulties of suffering people and then put these grateful people on the spiritual path for rapid spiritual growth and self-realisation. Always chant “Sai Ram Raghavendra” and “Sai Krishna Raghavendra”. I have been saved numerous times in crises by just repeatedly chanting “Sai Ram Raghavendra” with a heart overflowing with devotion and gratitude. There are seveal instances recorded evidences in our history as Divine intervention to save the life of a devotee or public at large. (1) Lord Rama appeared in the form of A bow & arrow in the sky to save the city of Maduranthakam near Chennai in Tamilnadu from a deluge. It has been recorded in the British annals in that period by the Collector of Chingelpet. (1) Samayapuram Mariamman near Trichy has appeared as a witness in a court case to save the life of her devotee during the British regime and this instance is also in the British records pertaining to that area of jurisdiction. Immensely happy to read about the conversations as well as the dharsan offered by Sri.Raghavendra swamy to Munroe. Blessed are the souls who happen to read this article. Swamy had given dharsan to one of my acquaintance also and spent more than an hour with him owing to his previous birth connection. Let us pray that if at all, there is any more Birth left for us, let us get the opportunity to know and serve Swami from our earliest age onwards and enjoy His Blessings. It is thrilling to know that Shri. Raghavendra Swami and Mr. Munroe were classmates in Krita Yuga and Munroe had his rebirth to safeguard / retain Mantralaya revenue in favour Mutt only, perhaps, as dictated by Shri. Raghavendra Swami. Looking forward to know still more miracles of Shri. Raghavendra Swami. We are willing to know more about Raghavendra swamikal. looking forward of his miracles which lead and hold us spiritual path of sanadhana dharma beyond what is existing.